When you decide to start your cloud path, we are to back you up on the way. Our Office 365 consultants will help you make your cloud solution an integral part of the enterprise software ecosystem and a useful tool for each employee. We provide both advisory and technical assistance depending on your current needs. With over a decade of SharePoint consulting and development experience coupled with hands-on expertise in Microsoft Azure, we help our customers create powerful cloud-hosted solutions comprising various Office 365 features. Professional team of Microsoft-certified developers. over a decade of experience with Microsoft SharePoint. Projects with Office 365 since its first release in 2011. Certified experts in Microsoft Azure. Office 365 includes a variety of applications and services that form the basis of employee digital workplace. We help organizations to compose an individual Office 365 collaborative toolset depending on their business specifics and collaboration requirements. Although Office 365 is a Microsoft-hosted platform that can free up your IT infrastructure and staff, you will still have to address common software challenges, such as deployment, customization or adoption. To handle the entire spectrum of problems you might face while launching your cloud solution, we cover the full scope of Office 365 services. Office 365 consulting. When you decide to start your cloud path, we are to back you up on the way. Our Office 365 consultants will help you make your cloud solution an integral part of the enterprise software ecosystem and a useful tool for each employee. We provide both advisory and technical assistance depending on your current needs. Office 365 implementation. We help you out with selecting a suitable Office 365 subscription plan aligned with your budget, IT strategy and collaboration scope. We will implement the selected Office 365 suite in line with the Microsoft requirements and set your cloud solution to ensure its efficient management and use. 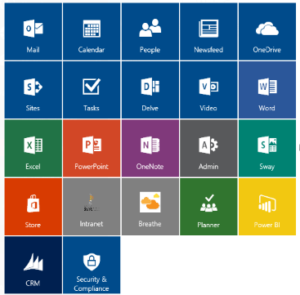 Office 365 customization. We tailor Office 365 solutions to adapt them to your specific corporate environment, industry requirements and employees’ preferences. We handle all-out customizations and develop unique custom features, including complex workflows, branded site templates, interactive chatbots, ready-to-use custom add-ins and more. Office 365 migration. Our team will help you plan and carry out a smooth migration of your on-premises, cloud or hybrid deployments to Office 365 along with preserving the integrity of your business data processes. To assess the preliminary scope of your Office 365 migration project, you are welcome to use our Office 365 migration calculator. Office 365 integration. We integrate the Office 365 suite with your enterprise solutions and tools to ensure transparent and continuous cross-department and enterprise-wide collaboration. We handle Office 365 integration with platform-based and custom on-premises or cloud environments and ensure employee directory synchronization and single sign-on to facilitate users’ journey between different systems. Office 365 support. If you don’t have dedicated specialists to keep an eye on your Office 365 deployment, you can delegate all the support issues to C4 CONSULTING. We offer flexible support options to let you stay in line with the platform updates, enable the Office 365 latest features, extend your solution with custom functionality and prevent your clouds from any turbulence. Office 365 training. Adopting a new cloud environment can be a challenge for both IT specialists and business users. To prevent any potential difficulties with the Office 365 adoption, we provide dedicated training sessions for Office 365 admins, developers and end users to help them manage and use their cloud solutions efficiently. WHY CHOOSE C4 CONSULTING AS YOUR OFFICE 365 CONSULTANT? Ensuring smooth transition to the cloud to let you reshape IT infrastructure and restructure IT staff painlessly. Implementing an optimal set of Office 365 services and applications to let your employees benefit from every single element of their new digital workplace. Finding a right balance between your customization requirements and Microsoft restrictions to help you get a unique and functional solution. Enabling stable protection of your cloud solution where corporate content, sensitive data, employees’ knowledge and expertise are immune. Tacking care of user adoption from the planning stage to guarantee your solution or its particular features are popular and meet users’ needs. Are you ready to start your movement to the cloud? Contact our Office 365 consultants to learn various cloud collaboration options for your organization or to elaborate on possible improvements for your existing Office 365 solution.